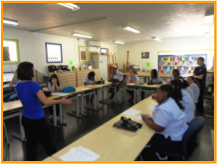 The Girl Power program is an educational program designed to enhance the self-esteem, self-worth and gender pride in girls ages 13-18. This educational program also aims to enhance skills focused on proper communication and negotiation, encourage abstinence or condom use as well as a general knowledge of STDs and HIV. 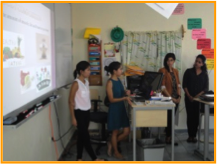 Since 2008 the BMS established the Girl Power program under its auspices, forming local community facilitators and encouraging adult female role models to be engaged in the lives of young girls. 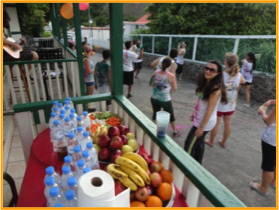 In June 2013, medical student volunteers under the supervision of SUSOM faculty Dr. Dumitrescu implemented at the Saba Comprehensive School workshops on nutrition, exercise and sexual health in parallel with the Real Men workshops. 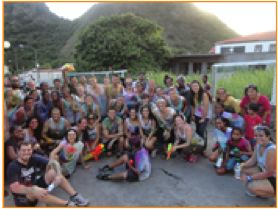 Saba Girls Run The Girl Power Club was formed as an afterschool counterpart to the Girl Power program and soon found a natural outgrowth in the Saba Girls Run, an initiative of local youth and the SUSOM’s Women’s Medical Student Association (WMSA). The motivational workout group meets weekly and has attracted male youth who intend to set-up a parallel group. 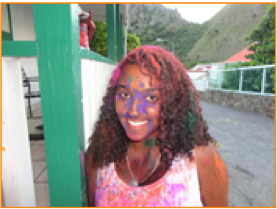 The signature events of the group are the fun Color-Runs but the WMSA has also organized other event such as the “Glowga,” and the “Saba Palooza.” The “Glowga” was a night-time glow-in-the-dark yoga session that gathered over 50 participants. The yoga instructor was a medical student and all participants were given colorful glow sticks to wear while exercising on the outdoor terrace of the medical school building. 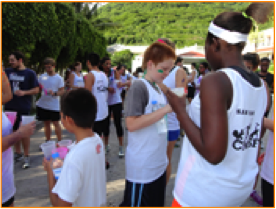 The “Saba Palooza” was a fundraising outdoors sports day held in December in which local youth teams competed for prizes. The proceeds from participation were donated to the Old Age Home. 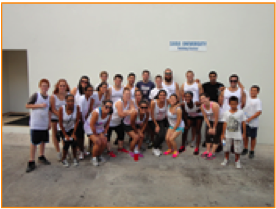 Following two successful “Color Run” competitions in 2012, the Women Medical Student Association and the Saba Girls Run initiative organized in August 2013 a “Color Cross-Fit” competition. 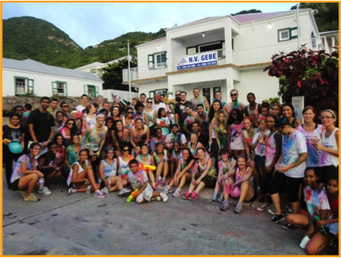 The race received a healthy turnout and started with a big burst of colors at the main gate of the SUSOM campus and went all around The Bottom ending up at the popular Saba Coffeehouse. Throughout the race, participants splashed each other with bursts of rainbow colored non-toxic powder and water squirting toys. This type of outdoors sports activities promote youth’s motivation to achieve personally set goals. Encouraging inclusion, they celebrate diversity, the beauty and strength found in an inclusive community. The runs foster an environment where the youth can explore being themselves so as to allow the growth of character in openness and dignity. The participants were both male and female children, teenagers, medical students and parents. 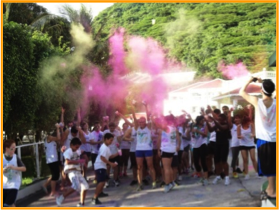 Everybody wore the event’s official T-shirts with the motto “Eat clean – train dirty.” Volunteers set-up the obstacles and armed with bright colorants, everyone got thoroughly splashed before making it to the finish-line at the Coffee House. 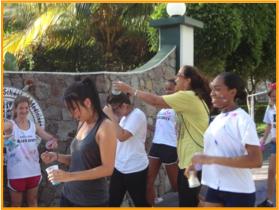 The event was designed as a youth and family oriented fundraiser with custom-made T-shirt. The proceeds from the official T-shirt sale and participation fees are to be donated to the Child Focus Foundation. 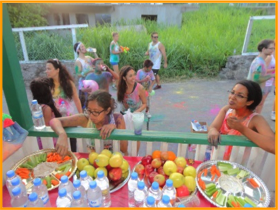 Underlining the health theme of the family sports event, the Body, Mind and Spirit Foundation provided healthy snack platters of vegetables with health dips and fruits for everyone. Come and visit us on Saba, Caribbean Netherlands!